On June 12, 1993, Nigeria conducted one of the freest and fairest elections ever: in that election, what united us was way stronger than the many things that divided us. 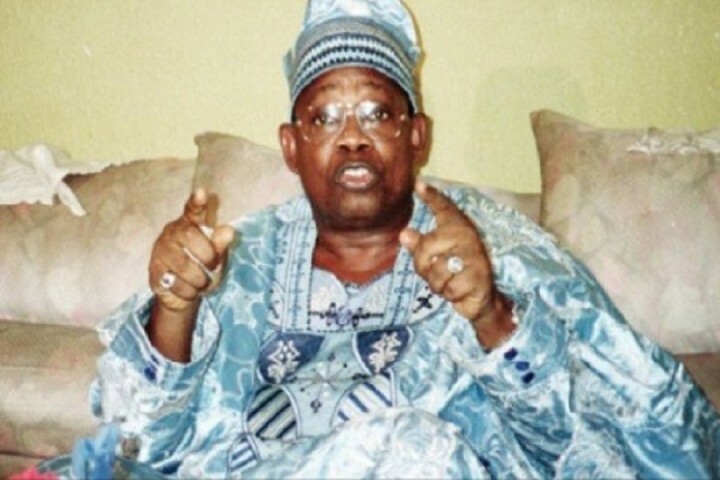 It was the election that saw Chief Moshood Kashimawo Olawale Abiola of Social Democratic Party (SDP) win Presidential election votes over Bashir Tofa of National Republican Convention. While many stories and controversies have emerged, it is however necessary we remember our history. Please note, materials below is from the public domain, NTA contributed only parts of it. His name, Kashimawo, means “Let us wait and see”. Moshood Abiola was his father’s twenty-third child but the first of his father’s children to survive infancy, hence the name ‘Kashimawo’. It was not until he was 15 years old that he was properly named Moshood, by his parents. Chief Moshood Kashimawo Olawale Abiola, CFR (24 August 1937 – 7 July 1998), often referred to as M. K. O. Abiola, was a popular Nigerian Yoruba businessman, publisher, politician and aristocrat of the Yoruba Egba clan. He ran for the presidency in 1993, and is widely regarded as the presumed winner of the inconclusive election since no official final results were announced. He died in 1998, after being denied victory when the entire election results were dubiously annulled by the preceding military president Ibrahim Babangida because of alleged evidence that they were corrupt and unfair. He was the editor of the school magazine The Trumpeter, Olusegun Obasanjo was deputy editor. MKO showed entrepreneurial talents at a very young age, at the age of nine he started his first business selling firewood. He would wake up at dawn to go to the forest and gather firewood, which he would then cart back to town and sell before going to school, to support his old father and his siblings. He later founded a band at age fifteen where he would perform at various ceremonies in exchange for food. He eventually became famous enough to start demanding payment for his performances and used the money to support his family and his secondary education at the Baptist Boys High School Abeokuta, where he excelled. He was the editor of the school magazine The Trumpeter, Olusegun Obasanjo was deputy editor. At the age of 19 he joined the National Council of Nigeria and the Cameroons ostensibly because of its stronger pan-Nigerian origin compared with the Obafemi Awolowo-led Action Group. From 1972 until his death Moshood Abiola had been conferred with 197 traditional titles by 68 different communities in Nigeria, in response to the fact that his financial assistance resulted in the construction of 63 secondary schools, 121 mosques and churches, 41 libraries, 21 water projects in 24 states of Nigeria, and was grand patron to 149 societies or associations in Nigeria. In 1956 Moshood Abiola started his professional life as bank clerk with Barclays Bank plc in Ibadan, South-West Nigeria. After two years he joined the Western Region Finance Corporation as an executive accounts officer before leaving for Glasgow, Scotland to pursue his higher education. From Glasgow University he received a first class degree in accountancy. He also received a distinction from the Institute of Chartered Accountants of Scotland. On his return to Nigeria, he worked as a senior accountant at the University of Lagos Teaching Hospital, then went on to Pfizer, before joining the ITT Corporation, where he later rose to the position of Vice-President, Africa and Middle-East of the entire corporation, which was headquartered in the United States. As a result, Moshood Abiola spent a lot of his time and made most of his money in the United States, whilst retaining the post of chairman of the corporation’s Nigerian subsidiary. In addition to his duties throughout the Middle-East and Africa, Moshood Abiola invested heavily in Nigeria and West Africa. He set up Abiola Farms, Abiola bookshops, Radio Communications Nigeria, Wonder bakeries, Concord Press, Concord Airlines, Summit oil international ltd, Africa Ocean lines, Habib Bank, Decca W.A. ltd, and Abiola football club. In addition to these, he also managed to perform his duties as Chairman of the G15 business council, President of the Nigerian Stock Exchange, Patron of the Kwame Nkrumah Foundation, Patron of the WEB Du Bois foundation, trustee of the Martin Luther King foundation and director of the International Press Institute. Chief Abiola, personally rallied every African head of state, and every head of state in the black diaspora to ensure that Africans would speak with one voice on the issues. Because of this man, there is both cause for hope and certainty that the agony and protests of those who suffer injustice shall give way to peace and human dignity. The children of the world shall know the great work of this extraordinary leader and his fervent mission to right wrong, to do justice, and to serve mankind. The enemies which imperil the future of generations to come: poverty, ignorance, disease, hunger, and racism have each seen effects of the valiant work of Chief Abiola. Through him and others like him, never again will freedom rest in the domain of the few. We, the members of the Congressional Black Caucus salute him this day as a hero in the global pursuit to preserve the history and the legacy of the African diaspora. From 1972 until his death Moshood Abiola had been conferred with 197 traditional titles by 68 different communities in Nigeria, in response to the fact that his financial assistance resulted in the construction of 63 secondary schools, 121 mosques and churches, 41 libraries, 21 water projects in 24 states of Nigeria, and was grand patron to 149 societies or associations in Nigeria. 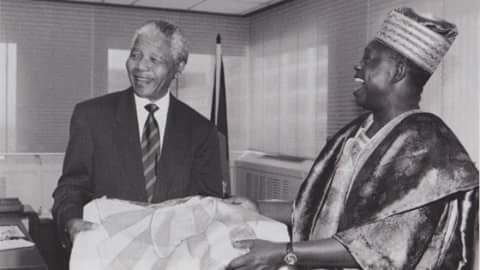 In this way Abiola reached out and won admiration across the multifarious ethnic and religious divides in Nigeria. In addition to his work in Nigeria, Moshood Abiola was a dedicated supporter of the Southern African Liberation movements from the 1970s and he sponsored the campaign to win reparations for slavery and colonialism in Africa and the diaspora. Chief Abiola, personally rallied every African head of state, and every head of state in the black diaspora to ensure that Africans would speak with one voice on the issues. After an aborted initial primary, Abiola stood for the presidential nomination of the Social Democratic Party (SDP) and beat Ambassador Baba Gana Kingibe and Alhaji Atiku Abubakar to secure the presidential nomination of the SDP ahead of the 12 June 1993 presidential elections. Chief MKO Abiola’s memory is celebrated in Nigeria and internationally. 12 June remains a public holiday in Lagos and Ogun states. There are also remembrance events arranged across Nigeria. MKO Abiola was known for his charisma and for being a man of the people. As a prominent social activist, democratic freedom fighter, and successful business figure, the continuing support for MKO Abiola is part of his legacy. 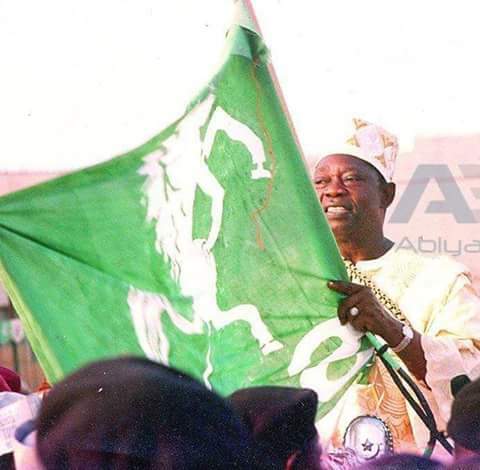 MKO Abiola Stadium and Moshood Abiola Polytechnic were named in his honour. There were also calls for posthumous presidential recognition. A statue, MKO Abiola Statue was also erected in his honour. Despite his popularity or because of it, MKO Abiola occasionally attracted criticism from political activists and detractors. Controversy was caused by a song by Nigerian musician, Fela Kuti. Kuti was a charismatic multi-instrumentalist musician, composer and human rights activist – famed for being the pioneer of Afrobeat music as well as a controversial figure, due to his unusual lifestyle and apparent drug use. It is believed that Kuti had entered into an acrimonious dispute relating to a contract with MKO Abiola’s record label. He used the abbreviation of International Telephone & Telegraph (IT&T) in a song criticising big multinational corporations. The song, ITT accuses such companies of draining Africa’s resources and makes specific reference to MKO Abiola (“they start to steal money Like Obasanjo and Abiola”). The fact that Moshood Abiola (a Southerner) was able to secure a national mandate freely and fairly remains unprecedented in Nigeria’s history. However, the election was annulled by Ibrahim Babangida, a political crisis that ensued led to General Sani Abacha seizing power later that year. Abiola’s involvement in politics started early on in life when he joined the National Council of Nigeria and the Cameroons (NCNC) at age 19. In 1979, the military government kept its word and handed over power to the civilian. As Abiola was already involved in politics, he joined the ruling National Party of Nigeria (NPN) in 1980 and was elected the state chairman of his party. Re-election was done in 1983 and everything looked promising since the re-elected president was from Abiola’s party and based on the true transition to power in 1979; Abiola was eligible to go for the post of presidential candidate after the tenure of the re-elected president. However, his hope to become the president was shortly dashed away for the first time in 1983 when a military coup d’état swept away the re-elected president of his party and ended civilian rule in the country. After a decade of military rule, General Ibrahim Babangida came under pressure to return democratic rule to Nigeria. After an aborted initial primary, Abiola stood for the presidential nomination of the Social Democratic Party (SDP) and beat Ambassador Baba Gana Kingibe and Alhaji Atiku Abubakar to secure the presidential nomination of the SDP ahead of the 12 June 1993 presidential elections. Abiola had managed to work his way out of poverty through hard work and symbolized the aspirations of many downtrodden Nigerians. 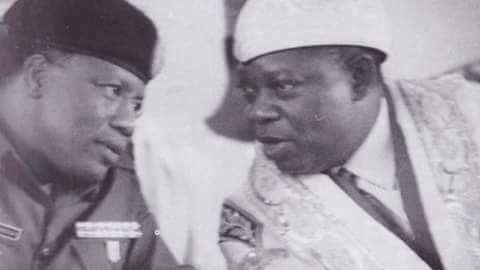 His commitment to the plight of ordinary Nigerians included establishing Abiola bookshops to provide affordable, locally produced textbooks in the 1980s when imported textbooks became out of the reach of ordinary Nigerians as the naira was devalued. He also made available daily necessities such as rice and soap at affordable prices in the market. We remember #June12. On that day, we stood as Nigerians and said “Democracy is the way”. We salute MKO Abiola for his strength. 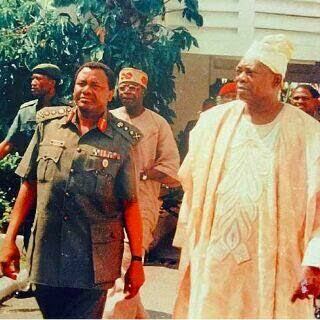 For the 12 June 1993 presidential elections, Abiola’s running mate was Baba Gana Kingibe. He overwhelmingly defeated his rival, Bashir Tofa of the National Republican Convention. The election was declared Nigeria’s freest and fairest presidential election by national and international observers, with Abiola even winning in his Northern opponent’s home state. Abiola won at the national capital, Abuja, the military polling stations, and over two-thirds of Nigerian states. The reason why the election was so historic, was because men of Northern descent had largely dominated Nigeria’s political landscape since independence. Oloye Abiola was made the Aare Ona Kakanfo of Yorubaland. It is the highest chieftaincy title available to commoners amongst the Yoruba, and has only been conferred by the tribe 14 times in its history. This in effect rendered Abiola the ceremonial War Viceroy of all of his tribespeople. According to the folklore of the tribe as recounted by the Yoruba elders, the Aare Ona Kakanfo is expected to die a warrior in the defence of his nation to prove himself in the eyes of both the divine and the mortal as having been worthy of his title. The fact that Moshood Abiola (a Southerner) was able to secure a national mandate freely and fairly remains unprecedented in Nigeria’s history. However, the election was annulled by Ibrahim Babangida, a political crisis that ensued which led to General Sani Abacha seizing power later that year. During preparations for the 2011 Nigerian Presidential elections there were calls from several quarters to remember MKO Abiola. Moshood Abiola was twice voted international businessman of the year, and received numerous honorary doctorates from universities all over the world. In 1987 he was bestowed with the golden key to the city of Washington D.C., and he was bestowed with awards from the NAACP and the King center in the USA, as well as the International Committee on Education for Teaching in Paris, amongst many others. In Nigeria, the Oloye Abiola was made the Aare Ona Kakanfo of Yorubaland. It is the highest chieftaincy title available to commoners amongst the Yoruba, and has only been conferred by the tribe 14 times in its history. This in effect rendered Abiola the ceremonial War Viceroy of all of his tribespeople. According to the folklore of the tribe as recounted by the Yoruba elders, the Aare Ona Kakanfo is expected to die a warrior in the defence of his nation to prove himself in the eyes of both the divine and the mortal as having been worthy of his title. He was awarded the third highest national honour, the Commander of the Federal Republic posthumously in 1998. In 1994 Moshood Abiola declared himself the lawful president of Nigeria in the Epetedo area of Lagos island, an area mainly populated by (Yoruba) Lagos Indigenes. He had recently returned from a trip to win the support of the international community for his mandate. 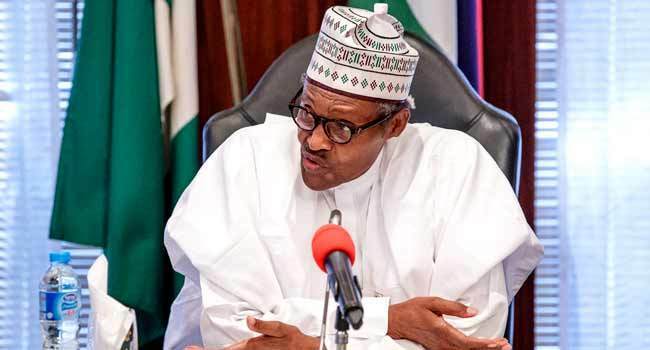 After declaring himself president he was declared wanted and was accused of treason and arrested on the orders of military President General Sani Abacha, who sent 200 police vehicles to bring him into custody. 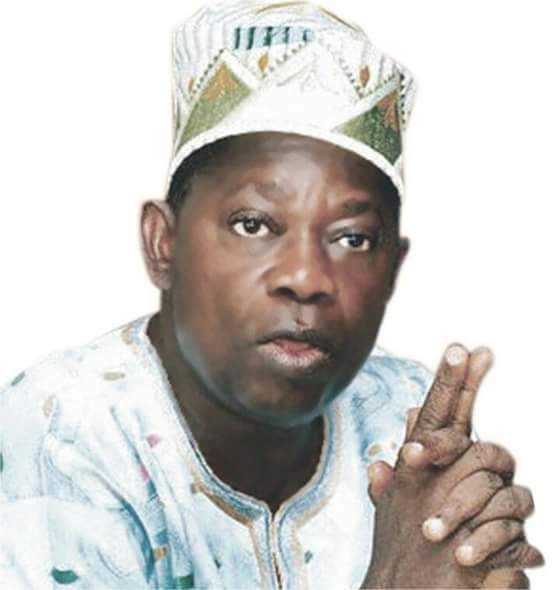 MKO Abiola has been referred to as Nigeria’s greatest statesman. His second wife Alhaja Kudirat Abiola was assassinated in Lagos in 1996 after declaring public support for her husband. Moshood Abiola was detained for four years, largely in solitary confinement with a Bible, Qur’an, and fourteen guards as companions. During that time, Pope John Paul II, Archbishop Desmond Tutu and human rights activists from all over the world lobbied the Nigerian government for his release. The sole condition attached to the release of Chief Abiola was that he renounce his mandate, something that he refused to do, although the military government offered to compensate him and refund his extensive election expenses. 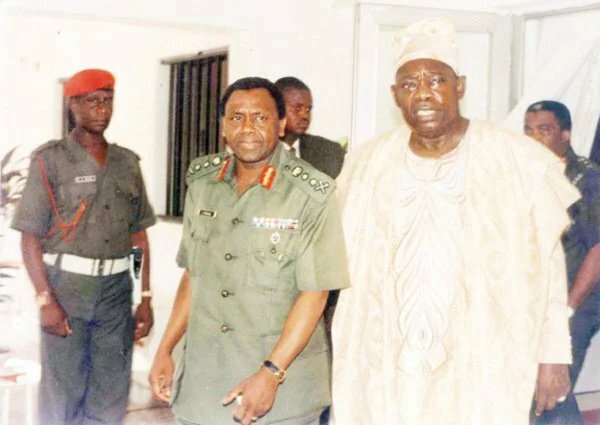 For this reason Chief Abiola became extremely troubled when Kofi Annan and Emeka Anyaoku reported to the world that he had agreed to renounce his mandate after they met with him to tell him that the world would not recognize a five-year-old election. Abiola died under suspicious circumstances shortly after the death of General Abacha. Moshood Abiola died on the day that he was due to be released, on 7 July 1998. While the official autopsy stated that Abiola died of natural causes, the final autopsy report, which was produced by a group of international coroners has never been publicly released. Irrespective of the exact circumstances of his death, it is clear that Chief Abiola received insufficient medical attention for his existing health conditions. As recounted at the time in a BBC interview with special envoy Thomas R. Pickering, an American delegation, which included Susan Rice, visited Abiola and during their meeting with him, Abiola fell ill, with what was presumed to be a heart attack which caused his death. A clause in Abiola’s will required that his heirs could prove that he was their father. Over seventy people were able to show that Abiola was their father using DNA tests. Seven children were descended from his second wife, Alhaja Kudirat Abiola. Moshood Kashimawo Olawale Abiola. (24 August 1937 – 7 July 1998) He came! He saw! He took and He gave!